Representing almost 300 organizations across all 50 states and Washington, D.C., the National Network to End Family Homelessness provides a strong voice to local providers working directly with families in communities across the nation. Guided by research, knowledge, and experience, the National Network puts evidence-based tools and best practices in the hands of providers, and brings new solutions to state and federal policymakers as we urge them to make families a priority. 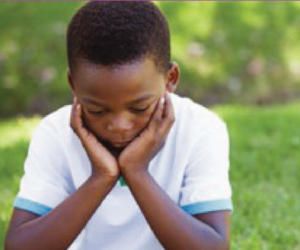 The Bassuk Center connects and supports communities across the nation serving families, youth, and children experiencing homelessness. Using research-based knowledge and evidence-based solutions, we advance policies and practices that ensure housing stability and promote the wellbeing of family members. We see a day when everyone in America has a safe and decent place to live, and the economic and social opportunities that allow families, youth, and children to thrive. The Bassuk Center is a non-profit, 501(c)(3) organization that relies on private donations as an important source for our funding. You can support our work by donating today. Use the Donate Button below to go to Pay Pal to make a secure credit card donation. Your donation to The Bassuk Center is fully tax-deductible as allowed by law. You will receive a letter from us acknowledging your donation as documentation for tax purposes. 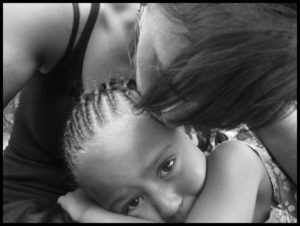 A national survey of community providers who work with homeless families finds that family homelessness is increasing, and shows very strong support for solutions that combine both housing and services. Our new report, Aced Out in Tier II Shelters, discusses the science of Adverse Childhood Experiences (ACEs), which significantly increase rates of diabetes, cancer, heart disease, alcohol and drug use, and suicide. 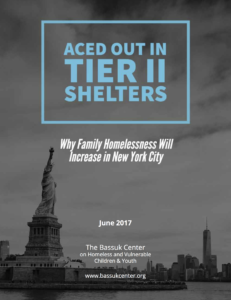 The report reviews conditions in New York City’s large family shelters (Tier II shelters) and concludes that shelter conditions are harming children by compounding the ACEs prevalent in their lives, and condemning them to serious disease and early death, and becoming homeless again as adults. We ask the Mayor to stop the city’s plan to build more large shelters that do not prepare families to remain stably housed after they leave shelter. Instead, we urge smaller scale shelters that provide essential services to reduce harm to families while in shelters and support their successful return to the community. We hope you will read this report and share it with your colleagues. Comments or questions can be sent to info@bassukcenter.org. Families now constitute approximately 37% of the overall homeless population and the numbers are increasing. An estimated 2.5 million are children—more than half under six years old. 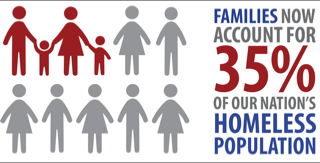 As a nation, we have committed to preventing and ending family homelessness by 2020. But we won’t accomplish this without sufficient resources and the political will to tackle the problem. Instead,family homelessness is downsized by federal policymakers to match available resources, rather than responding to the actual need. The Family Options Study (U.S. Department of Housing and Urban Development) followed an estimated 2300 families from emergency shelters in 12 communities. The results show that permanent housing vouchers are critical for stabilizing families in the community. However, decades of research and field experience also demonstrate that while housing is essential, it is not sufficient. Affordable housing must be combined with services that support families, youth, and children. This requires collaboration across systems of care, including housing, health and mental health, substance use, child welfare, and criminal justice. Building on the legacy of the National Center on Family Homelessness, we are forming the National Network to End Family Homelessness to share effective strategies and solutions across communities and systems, and press for decisive federal action. It is time to pay attention to the fact that we are creating a Third World in our own backyard and witnessing a growing human tragedy. We must demand from our leaders that not one child is homeless in America—not even for one night. Bassuk Center President Ellen L. Bassuk, M.D. Interested in hearing more from The Bassuk Center?